You've heard the rumors, and here it is! Another scholarship shootout for drivers with racing experience! Lakeville, Conn. (Jun. 23).Skip Barber Racing School is now providing more motorsports scholarships than before, with the addition of more prizes for more Karting Scholarship Shootout participants, as well as adding another scholarship shootout event to the calendar: The Skip Barber Race Series Champion Shootout, an event that will award young drivers with racing experience the same opportunity to compete for over $110,000 in scholarships. With an entry fee of $2,500, the first Skip Barber Race Series Champion Shootout will be available to racers who are 25 years of age or younger and participants of the current Western, Southern and Summer championships (see below for requirements). The event will take place November 4-6, 2011 at Mazda Raceway Laguna Seca and the winner will receive a full Seasonal Scholarship for 2012. The other top nine drivers will receive scholarship funds to compete in the upcoming season of Skip Barber Race Series events. These changes solidify the Skip Barber Racing School Scholarship Ladder, rewarding young racers who are dedicated to their craft and work their way through the successful system that has proven results. The ladder will start with the Karting Scholarship Shootout, an event that has been instrumental for 15 years in helping karters make the first step into motorsports. 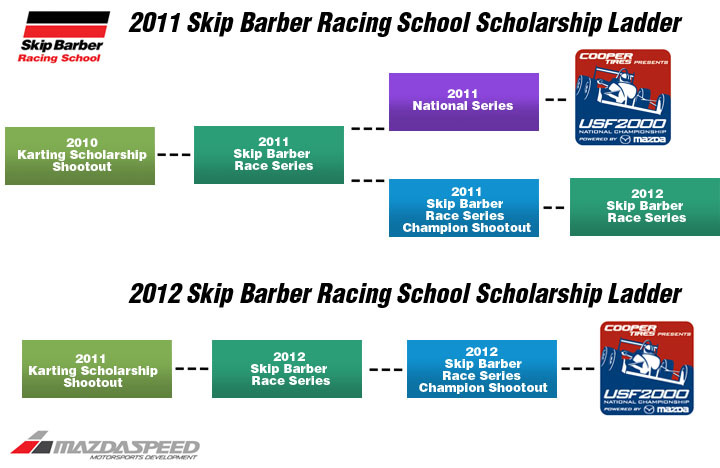 The winner of the 2011 Karting Scholarship Shootout will receive a scholarship to compete in the full 2012 Skip Barber Race Series of their choice. The other top nine drivers will receive scholarship funds to compete in 2012 Skip Barber Race Series events. At the end of the 2012 year, the top ten competitors of each Race Series championship will be invited to compete at no cost in the Skip Barber Race Series Champion Shootout: a three day event where participants will be evaluated on their overall performance. The winner will receive a scholarship to compete in the full 2013 USF2000 race season and 2nd through 7th place will receive funds to compete in 2013 Skip Barber Race Series events. *All scholarships funds are spread out over each race event throughout the course of the 2012 season, and cannot be applied to only a few select events. 1) Three (3) Skip Barber Racing School race weekends in 2011 in the calendar year leading up to the shootout. 1) Six (6) Skip Barber Racing School race weekends in 2012 in the calendar year leading up to the shootout. 2) Cost: Free, Entry by invite only. The Skip Barber Racing School Scholarship Ladder is further strengthened, providing a clear, set path for aspiring drivers to not only advance their careers in a timely fashion, but to become the best racer they can be, both on and off the track. No other developmental race series offers as much expert coaching both on and off the track, as well as media exposure, various scholarship opportunities and maximum, affordable track time. Click here for more information. Application and rules to be available shortly. For more information about Skip Barber Racing School, and to start your racing career, call a Series Advisor at 800.221.1131 today! For 36 years, Skip Barber Racing School LLC, the leader in high performance driving and racing education has operated a fully integrated system of racing schools, driving schools, racing championships, corporate events and OEM events across North America. Skip Barber Racing School is offered at more than 20 of America’s most prestigious race tracks. Skip Barber Racing School provides entry-level, equal car championships. The athletes are given media exposure, expert coaching, on-track arrive and drive experience, financial awards and motorsport scholarships. The reason many people choose to race with Skip Barber Racing is because they know it is the place where the stars of tomorrow begin their careers. The Skip Barber Racing School launched the auto racing careers of Ryan Hunter-Reay, Marco Andretti, Scott Speed, Jeff Gordon, A.J. Allmendinger, Raphael Matos, Spencer Pigot and many more. Can I get an age waiver since I look 25 and under? they should do a 25 and over shoot out with smaller prizes!! They should do a 50 and over shootout with larger prizes!! The announcement does not state it explicitly, but I'm assuming from the diagram of the 2012 "ladder" that the National Series is being eliminated after this year. I suppose it was inevitable given Mazda's decision to insert the USF2000 series into their championship ladder, but I'll be sorry to see the national series go. At its best, it served up some remarkably competitive racing. Very safe assumption, Peter. With entry lists in the low teens the last few years, it probably did not make business sense to continue. In the past, series like the Barber Dodge Pro Series and the National Series operated at a loss some years to serve as a beacon for young drivers, as well as a selling point for recreational drivers to race in a series with high credibility. There were good years, of course, like 2003, 2004, 2005, 2007, 2008, when the series had excellent car counts and notable and successful drivers like Raphael Matos, Marco Andretti, Conor Daly, Josef Newgarden, Connor De Phillippi, etc. Still, as a business that is tight on cash, I can see why the National series would have to go for now. I don't think the addition of USF2000 to the Mazda Road To Indy Ladder hurt National enrollment so much as the economy did. Numbers began to fall before USF2000 began its new championship. Also, F2000 Championship Series (the other F2000 series with very healthy car counts) had co-existed well with Skip Barber even during the National's good years. F2000 formula cars are different enough from Skip Barber cars to be really different products. There have to be enough funded customers who need Skip Barber training at this price point for the series to make sense. Let's look into the past at how the Regional Race Series developed drivers before there was a National Series. The first "National" race was a season ending one-off invitational race that took place at Lime Rock, won by Ryan-Hunter Reay. The drivers were invited from the Regional series. In years prior, Regional titles were often won by the same caliber young career-minded drivers that drove later in the National series. Regional champions and selected standouts were invited to the "Big Scholarship" shootout each winter in Sebring, to drive the carbon fibre V-6 powered Barber Dodge Pro Series cars for a few days and compete for a sesaon in the Barber Dodge Pro Series, a value of about $200,000. Ryan-Hunter Reay was one of the winners of that intense shootout. It is my opinion that the Skip Barber Race Series will continue to produce top caliber drivers without a formal stand-alone National series. They will do it the same as they had many times before the Natinoal series was created. I will miss the National series dearly. But given the resolution of other current issues, the Skip Barber program will still be an awesome place to learn to drive a race car. I wouldn't be surprised if the Western Series is also mothballed. That would be a real shame if for no other reason than Laguna Seca is such a great track and Monterey is such a great place to visit. Ugh if that happens. i have to be able to race at LS at least once a year! !